Did you know that Pinocchio was Disney’s second animated film (after Snow White, of course)? Well this is actually one of those things that I DID know before starting this blog, and now you know it too. You’re welcome. 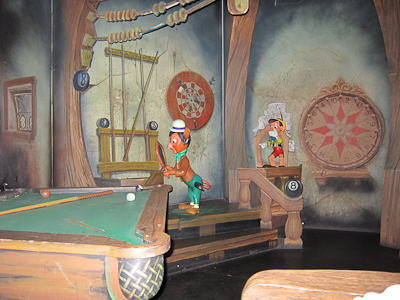 Pinocchio’s Daring Journey is one of the Fantasyland “dark rides” (those ones where you sit in a vehicle and ride around in the dark–if you’ve been to Disneyland you know what I’m talking about. If not, that’s all the explanation you’re going to get. Sorry.). I haven’t been on it in recent memory, recent memory being the last 30 years, so when it seemed like the line was short, I decided to go for it. Are you man enough for this ride? I mean wooden doll enough? Or honest/short-nosed enough? Or whatever. 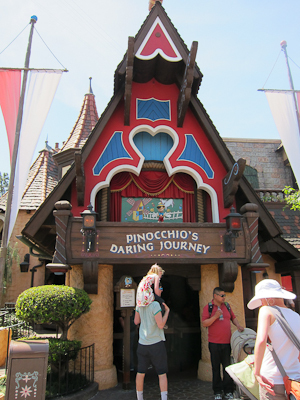 Pinocchio is located right by King Arthur’s Carrousel, which is Theo’s favorite ride. I’m interrupting this narrative to tell you that because right after I took this picture, Theo started saying, “Horse! Horse!” so we went for a spin on the carrousel first. Satisfied with his horse-riding, a happy Theo and I walked back over to go on Pinocchio. I was a little nervous because it looked like there was a very short line, but sometimes what you see from the outside of the ride disguises the fact that there’s 56 miles of zig-zagging behind the scenes. So I was a tiny bit nervous, but it’s Pinocchio so I thought I’d take my chances. Is there more to the line than this? Actually, no. This is pretty much all there is. The dark rides aren’t called “dark” for nothing. They’re dark. Now I know that Snow White’s Scary Adventure is, in fact, scary (you can tell by the number of traumatized children coming off of it) so I’ve been avoiding that one when I have Theo with me. He’s not a huge fan of the dark and has, in the past, started getting very nervous/crying in extended dark and scary scenes. Gepetto wants a kid so he makes one out of wood. The Blue Fairy comes and animates him or something. Umbrella-wielding Jiminy Cricket shows up on the scene because Pincchio is either in the habit of, or will soon be in the habit of making what adults call “Bad Decisions” using “Poor Judgment.” Also Pinocchio’s nose grows longer and longer each time he tells a lie, rendering a polygraph machine completely superfluous if he should ever commit a real crime. Something happens and Pinocchio goes out into the world and is in a puppet show with a bad guy. 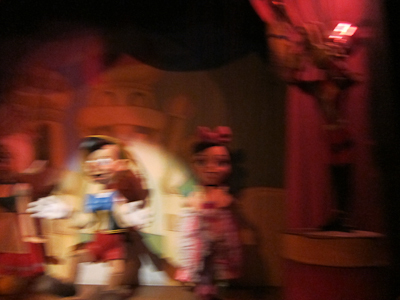 Then something else happens and Pinocchio uses his Poor Judgment to make some Bad Decisions and gets sucked into Pleasure Island, which I keep wanting to call Treasure Island and which also seems to be all awesome and fun but turns out to be like a time-share presentation from Hell. He also gets turned into a donkey. Then he is sad. Then something else happens and he goes home and for some reason, the Blue Fairy thinks he should become a real boy and turns him into one. The end! I’m seriously wondering if I should brush up on some of my Disney classics before I go on these rides, because that was literally all I remembered going into the ride. Anyway, back to the ride. So you and your unwitting, trusting, not-a-fan-of-the-dark toddler hop onboard your ride vehicle emblazened with a friendly-looking Jiminy Cricket leading the way. What could possibly go wrong? 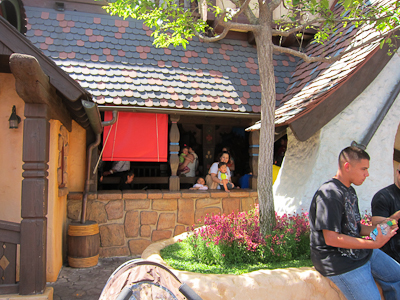 The Disneyland website calls this a “4-person woodcarvers cart.” Just so you know. Then you jump immediately to the Bad Guy’s puppet show. Stromboli? Isn’t that a food? Yes, I’d love a stromboli with pepperoni and mushrooms! Immediately I am faced with the biggest challenge of blogging this ride. It’s extremely difficult to take pictures inside. 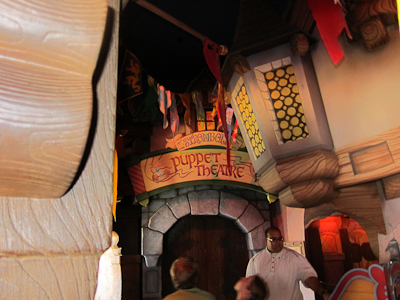 It’s the Puppet Theater thing. Is that a can-can dancer or an early version of Lilo from Lilo and Stitch? No clue. I AM AN AWESME PHOTOGRAPHER!!! 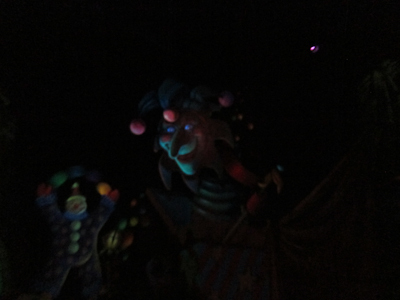 Did I mention this ride was dark? Actually, Theo was doing really, REALLY well. He was snuggled in close but was still looking around and was quiet and not crying. He was really being quite brave. Part of the problem with photographing this ride is that your vehicle woodcarvers cart actually gets moved around from side to side quite frequently, so you’re never really looking at any given scene for a long time. Like enough to take a picture with a point and shoot. I did start anticipating pictures, but the aim was a bit off. It’s Pleasure Island and some lady’s hair! Theo continued to do well until we started to get to the really scary part of the ride, heralded by this dude. I have always hated jack-in-the-boxes. What’s fun about some terrifying clown or jester thing popping out of a box when you don’t expect it to? At this point, our intrepid little toddler cuddled in even closer, but rather than crying, he simply started saying, “All done? All done? All done?” No sweetheart, just a little bit longer. WHAT KIND OF MOTHER BRINGS HER 2-YEAR-OLD ON A TERRIFYING RIDE??? Next, Pinocchio and his little friend who also uses Poor Judgment to make Bad Decisions get turned into donkeys. It’s donkeys shooting pool. Of course! Anyway, I had forgotten about Monstro until he came after us, growing increasingly larger as I got this shot. And to his IMMENSE credit, Theo did not flip out at this point, which was very good because I almost did. What a trooper! 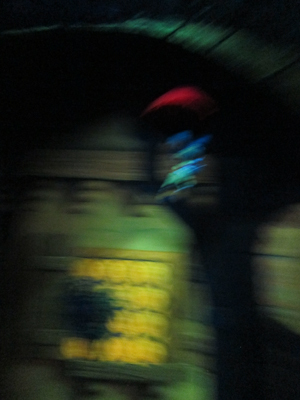 So somewhere along the line, Monstro disgorges you and you end up back in the toy shop (this is the part that’s all fuzzy in my mind) and the Blue Fairy, who is some kind of projected image that was impossible to photograph, turns Pinocchio into a real boy. Look, Dad! I don’t know how I got here, but I’m real! That picture kind of looks like it’s in 3D except it’s really just the lighting and the fact that I’m still moving. 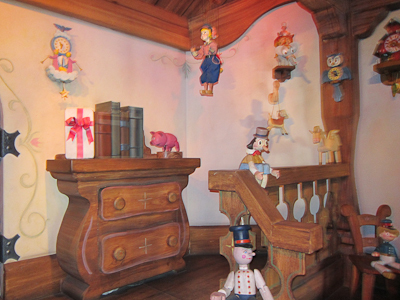 You can also see more of Gepetto’s toy shop. And then the ride is over. Theo survived, sanity intact, despite asking if we were “all done? all done?” for the entire second half of the ride. All in all, it’s not a terrible ride, but it’s very dark and not for the fearful. Incidentally, because you care, my other experience with Pinocchio is that when I was very young, I was in a community theater’s musical version of Pinocchio that was not the Disney version. I remember that because our Jiminy Cricket was called “Geronimo” or something. My big role, I am not kidding here, was as a Leaf. Now, how on earth does a leaf figure into this story? Well, the Leaf was a very important role, because we (actually I was one of three Leaves) had two things to do. One was that every time Pinocchio told a lie, we held portions of the ever-growing nose and marched out on stage and attached them to Pinocchio’s existing nose. Obviously that’s the role of a Leaf, and completely inconspicuous too. 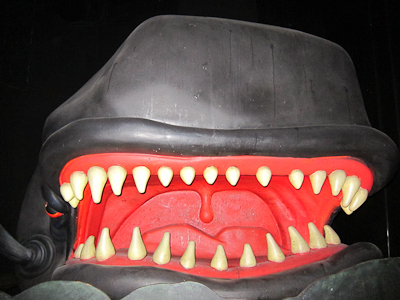 Our other important role was that we had these stuffed fish, and during the Monstro scene, we stood at the side of the stage and threw fish at Pinocchio to emphasize that he was being swallowed (along with several stuffed fish) by a whale. It was serious high-tech theater. I wish I was kidding people, but that’s the late 70’s/early 80’s for you. My 18 year-old thought this was scary, good for Theo and you for hanging in there (although one doesn’t have much choice to leave after the ride begins, does one?). Those dark rides are scary! I remember the first time I took my oldest to Disneyland – he was 18 months old or so. We did Peter Pan first, and while it didn’t scare him, it was dark, loud, and he didn’t know the story already. (Why did I take him in there?) 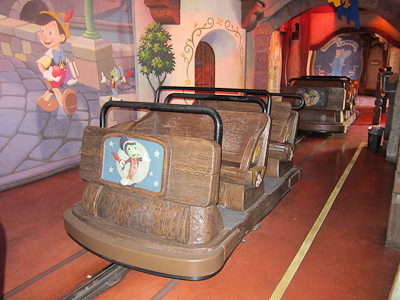 After that we stayed on outside rides for the most part – Casey Jr, Teacups, Storybookland, Jungle Cruise, etc. and it went great. I heard about your blog on “Wait Wait” & just wanted to leave a freindly comment. Your blog is really funny and I love Disneyland. I wish I could go every day of the year and explore! Thanks for writing and the laughs! I love love LOVE this blog. My two favourite things in the world are Disneyland and Wait Wait Don’t Tell Me….which is how I found you, and how excited I am that I did! What an awesome and convenient plug for your blog you got on air there! I’m jealosu! But your blog is awesome, and well deserves a lot of traffic. I wish I llived close enough to disneyland to do something like this! Keep blogging — I am absolutely loving this! 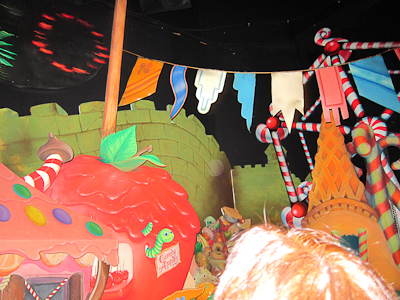 I love those dark rides but I totally understand how inappropriate they are for lil’ ones. When I was little I used to call Mr. Toads Wild Ride, Mr. Toad goes to hell. Nice, I know. My mother was impressed. Recently, I went with my sister, niece and nephew and I went with them for the first time (in many years) onto Peter Pan (I usually don’t want to wait in the line.) It was so wonderful as an adult, we lucked out because we were by the carousel during the fire works so when they opened it up we were in line fast. Yay! For being a leaf. I really enjoyed this post, particularly your description of Pinnochio, the movie. That’s pretty much as I remembered it too! 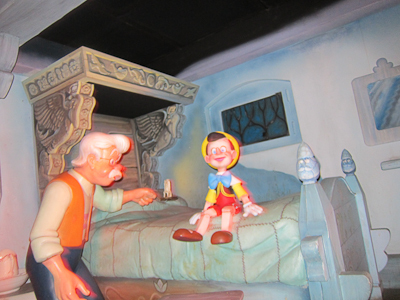 The thing is… Pinocchio does NOT become a real boy at the end of the ride… Geppetto just says “Pinocchio’s home” and he is sitting on the bed as a puppet. Doesn’t make sense I tells ya! Forgive me for asking, but isn’t the whale’s name “Monstro” rather than Maestro? Ha! You’re right! 😆 Wow, this post is up for over a year and nobody else caught that? 😆 Thanks. Just happened upon your site today; planning our first return to D-Land since we moved from So Cal in 2006 and I am EXTREMELY excited to go. This blog ought to keep by busy until then. Thanks for this amazing blog! Been on this ride today it was like Quentin Tarrentinos take on Pinocchio it terrified our two year old! I’m so sorry, I hope your kid isn’t permanently traumatized. Even now, at age 8, Theo is like “is that the one with the giant whale that tries to eat you?” Yes, my dear, it is. Avoid Snow White.